In company, no doubt, with many NLM readers, I often find very deep spiritual and intellectual nourishment in reading the Vultus Christi blog, maintained by the Prior of Silverstream, Dom Mark Kirby, OSB. Just a few days ago, Fr. Kirby posted a splendid article entitled "Saint John XXIII: The Divine Office & the Council," which, in addition to the author's insights, offers us the full text of Pope John's Apostolic Exhortation Sacrae Laudis of 1962. To read this is quite simply to see, in its full starkness, how bitterly Pope John has been betrayed, how ruthlessly his own piety and doctrine were trampled under foot, and how much rebuilding falls to us if we wish to reconnect with the living stream of worship that comes to us from our forefathers. Here, then, are some of Fr. Kirby's reflections. The Apostolic Exhortation Sacrae Laudis (6 January 1962) is, to my mind, wonderfully revealing of the piety of “Good Pope John”. There were and there are many, both in the Church and in the secular media, who would have us believe that Papa Roncalli was a revolutionary, a modernist, an iconoclast. Nothing could be further from the truth. How exactly did this misrepresentation of Pope John XXIII become so prevalent? It was, it seems to me, a question both of image and of personal style. Pope John XXIII differed in a number of very obvious ways from his predecessor, the Venerable Pope Pius XII. Whereas Pius XII was thin and hieratic–looking, John XXIII was rotund and grandfatherly — not only Papa, but also Nonno. Although both Popes were seasoned diplomats, Pacelli’s diplomacy was aristocratic in style; Roncalli’s diplomacy had the shrewdness of the Bergamasque peasant. Pacelli was convincing; Roncalli was winning. "The Breviary is in very truth a perennial and inexhaustible fount of supernatural light and grace. Small wonder, then, that the Breviary serves this Second Vatican Council as a source-book, as is evidenced in the reports of the careful, unremitting work of the various preparatory Commissions. It is a mine of purest doctrine and wisest counsels of ecclesiastical discipline, admirably adapted to present needs. We are therefore justified in Our assertion that in entering upon a new era we have preserved our ancient heritage intact. It is an era which seems to hold the promise of a great spiritual advance." 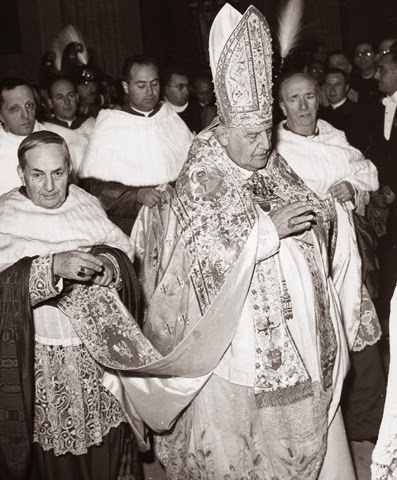 The aim of the Council was, wrote Saint John XXIII, “to seek to recapture some of that ardor displayed by the Church in her youth, and thus to restore to her the full splendour of her countenance”. We can certainly pray, even now, through the intercession of “Good Pope John,” that this aim of the Council will, by the grace of the Holy Ghost, be realised even at this late hour in spite of the accumulated contradictions, disappointments, and failures of the past fifty years. The full splendour of the countenance of the Church will not be restored until the prayer of the Church is restored to its rightful place and until her bare ruined choirs, warmed and illumined by the flames of a living liturgical piety, begin to resound again with the sound of many voices. Fr. Kirby's post then gives the text of Pope John XXIII's Apostolic Exhortation Sacrae Laudis.